Safely banish dirt and grime from your fine flooring with this all-natural recipe and top-notch technique. Whether newly installed or more than a hundred years old, hardwood floors are a striking feature in many homes. Wood is a naturally resilient material, and sealed with a urethane finish hardwood flooring can take even the heaviest use for many years before needing to be refinished or, in rarer cases, replaced. 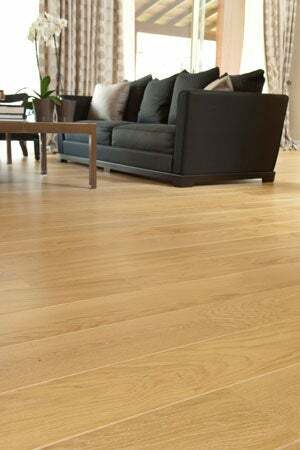 Yet while wood floors are on many a “must” list for their traditional elegance underfoot, they do demand more finicky care and maintenance than such materials as laminate, vinyl, or tile, which resist scuffs and are easier to clean. While hardwood floor cleaners abound on the market, there are several smart reasons to make your own. Some commercial products contain chemicals that can irritate the eyes, skin, or respiratory system, or be toxic if ingested. If you have young children or pets often playing on (or eating off) the floor—or you simply appreciate the health and environmental benefits of a “green” home—you may wish to avoid commercial cleaners in favor of an all-natural approach. 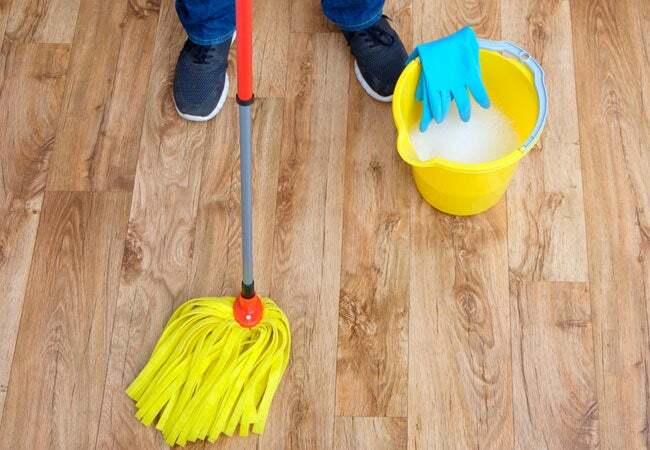 Plus, store-bought products specifically formulated for hardwood floors can be pricey, around $7 to $20 for a 32-ounce bottle, while the homemade hardwood floor cleaner recipe here can get you nearly 200 32-ounce mixtures from a single $16, 32-ounce bottle of castile soap. That being said, not all natural cleaning products are appropriate for hardwood floors. Harsh acidic ingredients like vinegar or lemon can strip the urethane finish, making floors appear cloudy and dull. And too-vigorous scrubbing—either with a cleaning tool or by adding an abrasive ingredient like baking soda to a cleaning solution—can also damage the finish. The best homemade hardwood floor cleaner will remove dirt without harming the finish of the floors below. Our recipe relies on castile soap, an eco-conscious alternative to dish detergent or other cleansers, and a microfiber pad to clean gently. Before using the formula, sweep or vacuum flooring well to remove any loose dirt or debris. Then simply mix, mop, and admire your handsome hardwood! Add the castile soap, water, and—if you’d like a light scent—essential oil (like peppermint, orange, or lavender) to a spray bottle. Screw the top on tightly and shake well to mix. Before using any new cleanser on your entire floor—this one included—test it on an out-of-the-way spot, such as under a piece of furniture. Apply following the directions below and rinse, then check for any hint of damage before continuing with the rest of the floor. Working in small areas (about three square feet at a time), spritz the cleaning mixture onto the floor. Be careful not to spray too much of the homemade hardwood floor cleaner at once to avoid water sitting too long on the surface. Excess moisture can penetrate the wood and cause serious damage to the boards along the lines of swelling, cupping, warping, and even separating. Using back and forth motions along the grain of the wood, work in the cleaning solution with a dry microfiber mop. (Avoid pre-dampened pads; there’s ample moisture in the spray). Continue working in small patches, rinsing and squeezing excess water off your mop as it becomes soiled until you’ve done the whole floor.